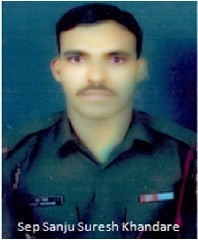 Sepoy Sanju Suresh Khandare (26) hailed from Mana Village, Teh – Murtizatur, in Akola district of Maharashtra. He belonged to 51 Rashtriya Rifles unit and was serving in J & K area in 2017 when he was trapped by a horrific avalanche. Sep Sanju Suresh Khandare is survived by wife Smt Sheetal and a 5-month-old daughter. 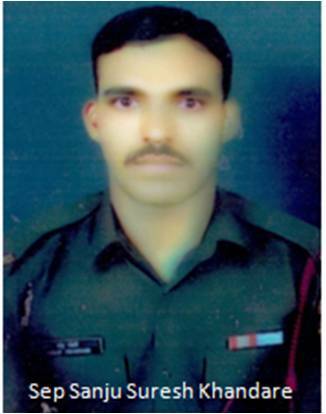 Sepoy Sanju Suresh Khandare was one of the 15 soldiers who died in an avalanche at Gurez sector of North Kashmir on 25th Jan 2017. There was heavy snowfall before the accident, resulting in multiple avalanches in Jammu and Kashmir. The Chandigarh based Snow and Avalanche Study Establishment had warned of more avalanches in Jammu and Kashmir and Himachal Pradesh before the accident took place. The first avalanche hit Gurez on 25 of January morning, in which a family of four civilians had died. The second took place around the same time in Sonmarg, chiefly a tourist area, where an army camp was located. The avalanche that proved deadly for the army hit the post at Neeru village in the night of 25 Jan 2017. The post at Neeru village was located in Tulail area, 25 Kms away from Gurez town in North Kashmir. The place located along the LOC normally remains cut off by road in winters. The avalanche hit the area few hundred meters away from HQs of 51 RR unit and trapped the soldiers, who were on patrol. 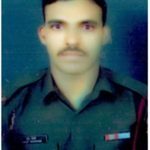 The army dispatched the rescue teams and seven soldiers could be rescued but, Sepoy Sanju Suresh Khandare, who had been buried in snow, could not be saved. I great frnd of mine. A great personality, a true professional. can’t say in words my eyes are in tears……. Now days the mandir parade is no more without you ….. sanju miss you..